Oh no. I was just browsing through Fashion Union site trying to find the links to my shirt and jacket and ended up finding the most amazing shoes and dress - someone please come and help me and my bank balance before we do something stupid. A couple of weeks ago I was out with Rob and when we got home I realised that one sleeve of my Toppers leather jacket was covered in white paint. I wasn't even near any walls, never mind one that had just been painted, so god knows how that happened. And it wasn't bird poo either before you start to get embarrassed for me. Thankfully this little Fashion Union number turned up the next day, because I'd be lost without a leather jacket. The blouse I'm wearing's unfortunately sold out but they've got lots of other nice ones available at the moment for your perusal, including this ombre one (altogether now... ooooh). Time for me to go back to my uni work. On that note actually, I'm so sorry that I haven't been able to reply to everyone who's commented recently - I'm trying my best but I'm slowly drowning under assessments and presentations. Please hurry up May. you actually have the best style - looking amazing as always! The shirt is beautiful! I also feel the same, my credit card is constantly suffer! Good luck with your Uni work! Ohh that dress is just a bit cool.. if only I had the moolah! I really want some variety of dungarees! That blouse suits you beautifully you gorgeous one, I can't pull of such colours with my pasty-ness! OBSESSED with the print on that shirt. Looking lovely as ever you lil fox! WAH I love this look. I think I'd die if I got paint on my fave toppers jacket! I'm with you, forever spending! you look amazing! love the geometric print on the shirt, so cute! Actually in love with this shirt and jacket and may need them both. Gah! Love the print on the top, it's so unique! Such a nice jacket. In this post you look like Blair Waldorf's edgy sister, hahaha. Love this shirt so much!!!! :D Looking bloody fab as always. Sorry to hear about your white paint nightmare but great replacement. I love your shirt. I do the internet window shopping when link searching thing too. I love the jackt, it's so cool! I'm heading to the website now. I love this shirt and your style. You always look amazing! 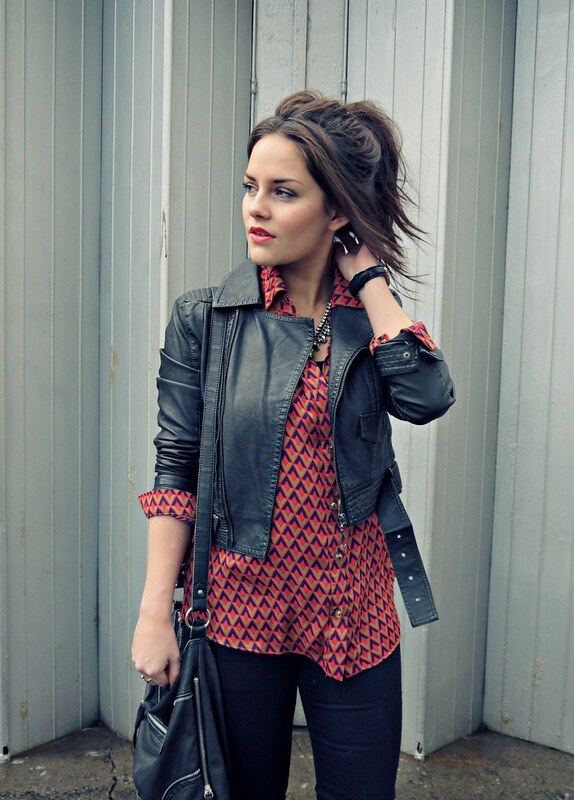 I love the contrast of the bright blouse against the black. That handbag is gorgeous too, I'm on the look out for something similar but I can be rather picky with bags.